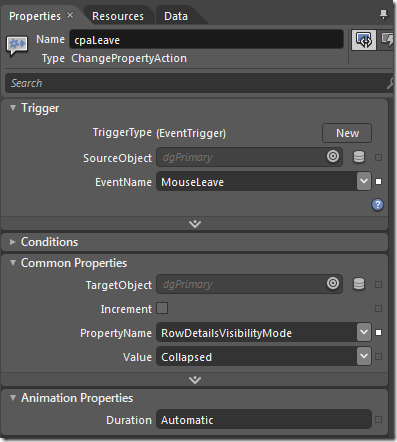 In Xaml the determining when to trigger the visibility, or the hiding of controls or their functionality is a key concept of doing either WPF or Silverlight programming. This article builds upon my article C#: WPF and Silverlight DataGrid Linq Binding Example Using Predefined Column Header Names in Xaml where we are going to add behaviors to the datagrid shown. (Don’t worry about reading the article, for I will get you up to speed with the code snippets in this article.) We will use Microsoft’s Expression Blend product to do the dirty work of xaml modification to our DataGrid and it will be shown in a step by step process. The user gets the description when the row is clicked. First thing we need to do is setup our datagrid. Below is the xaml and the code behind to load our datagrid. Note the datagrid has the RowDetailsVisibiltyMode set to collapsed. That means that when a user clicks on the row, it will only select it and not open up our description. The loading of the ItemsSource happens during the construction and after the initial initialization and is shown in C# in the second pane. One of the easiest ways to add a behavior [of the action] to a control is to use Blend to add an interaction behavior. In our case we want a mouse over action to open up all of the Row Details and a secondary action to close them when the mouse leaves. 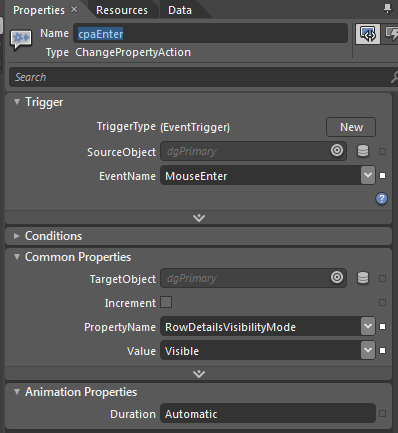 The behavior we need to search for in blend is the ChangePropertyAction. 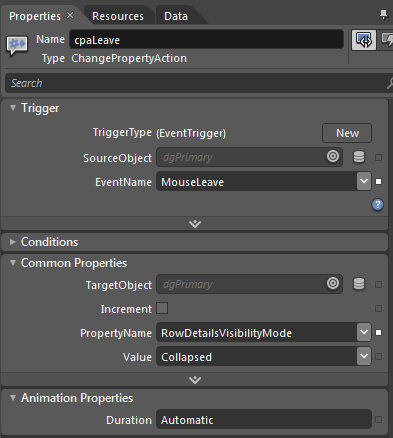 Below we drag (or add) two behaviors to the datagrid and change the RowDetailsVisibilityMode to visible on mouse enter and to collapsed on mouse leave. The result is that the header row will have two columns with the name “File Name Before” and “File Name After” will subsequently bind them to a data object with the property names of “Original” and “New”. We will read in a directory for the WPF example from the hard drive and fill the original file names to the first column and a generated name for the second column. 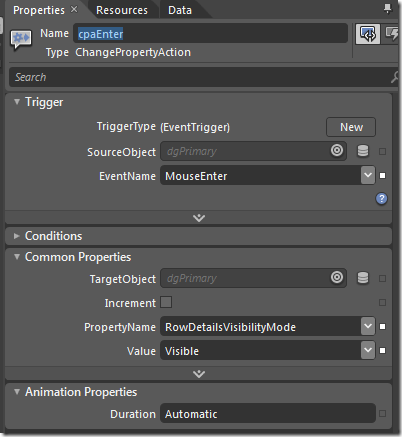 Since we have specified in the Xaml that we are binding to “Original” and “New” properties the dynamic linq object created will have those properties. Note: Out of the box editing the rows will throw an exception. To fix that make each of the rows read only.